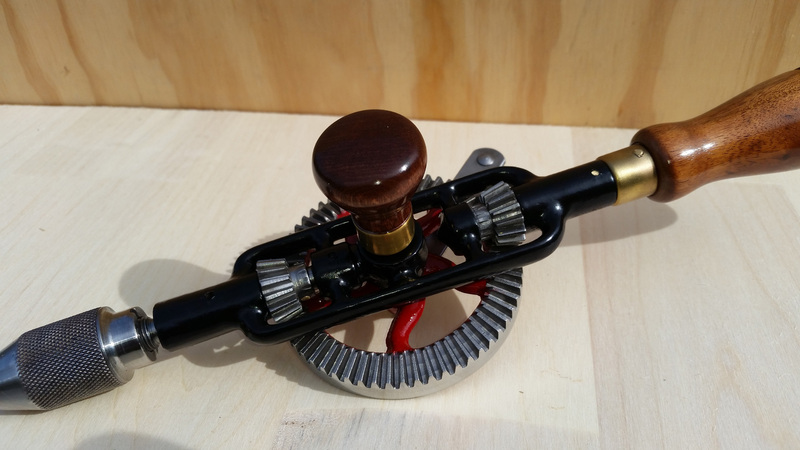 The last post left off after I’d completed refinishing of the wooden parts of the hand drill. 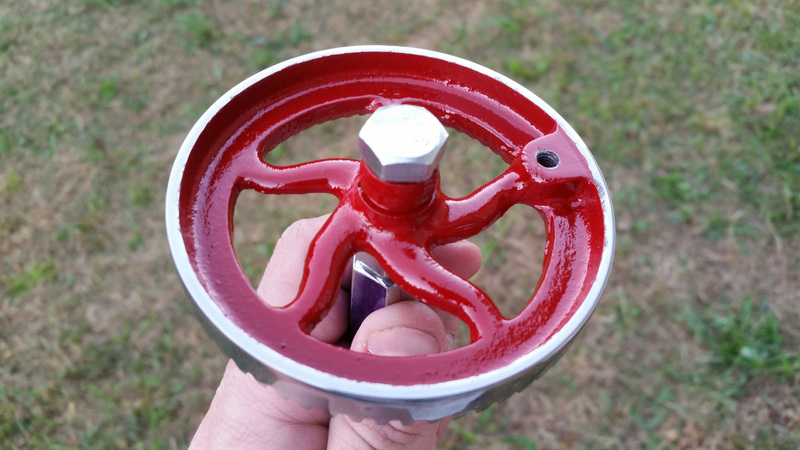 This post covers stripping and painting the frame and wheel, polishing a few remaining pieces of hardware, and reassembly. 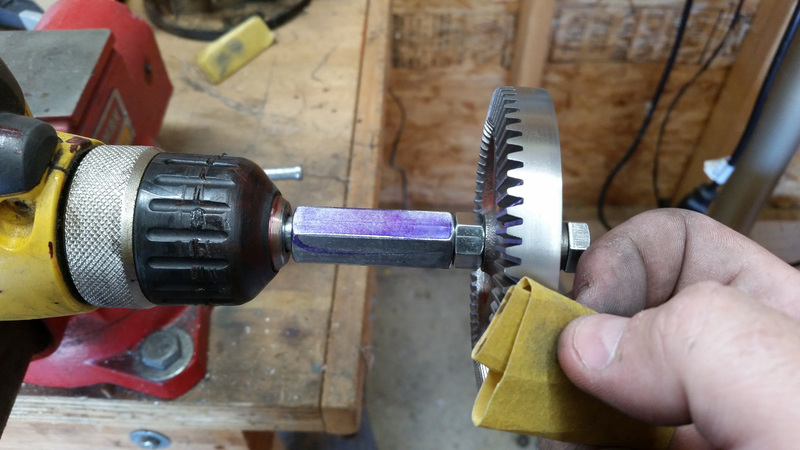 I began by sanding the bare metal portions of the wheel using my drill jig. I worked up from 220 grit to 2000 grit, removing nearly all of the scuffs and dings. A few of the deeper ones would have required removal of too much metal, but they’re so polished, they’re not really noticeable. 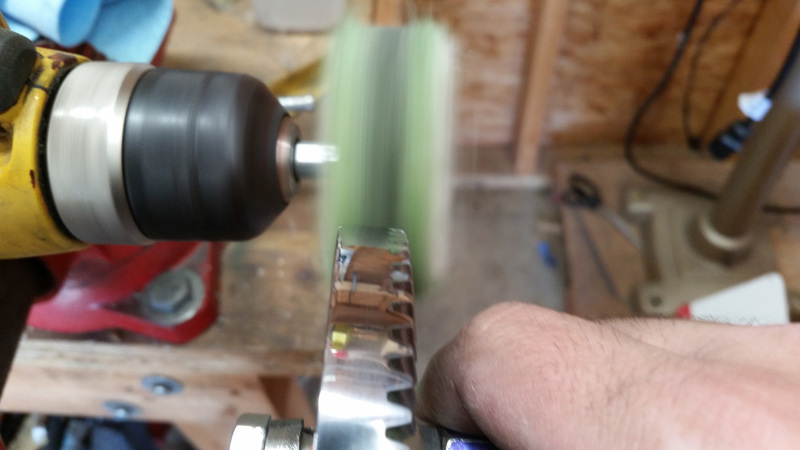 After 2000 grit, I switched to a cotton buffing wheel and the same green compound I use to polish blades. 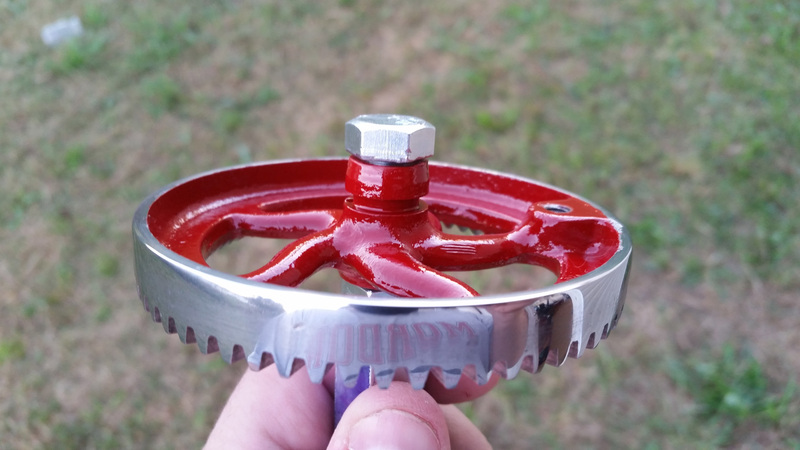 Here’s the wheel after polishing. I think it’s a pretty decent job – you can read in it like a mirror. 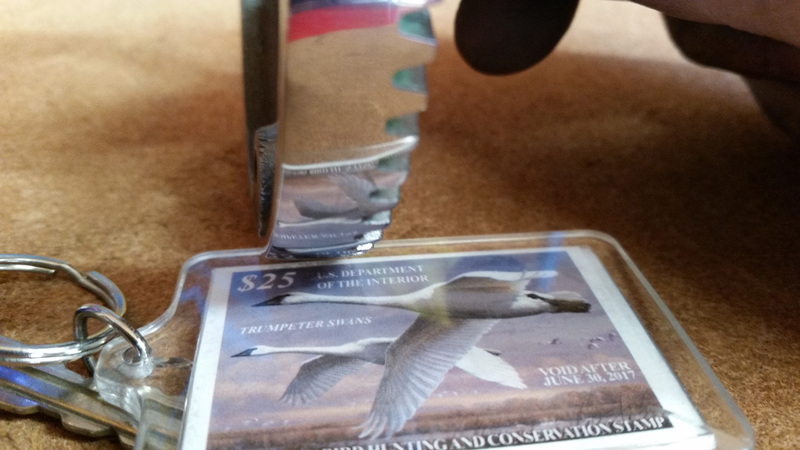 That’s my duck stamp for entry into WMAs. 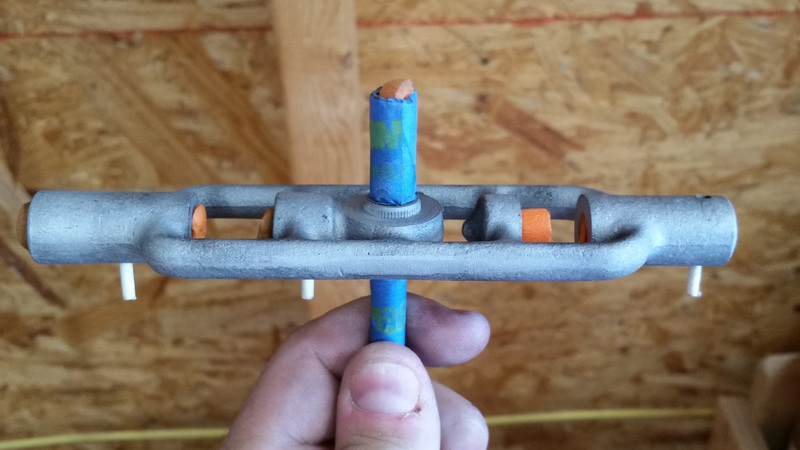 I sanded the rust off the axle post on the frame, then I masked off everything I didn’t want to blast. 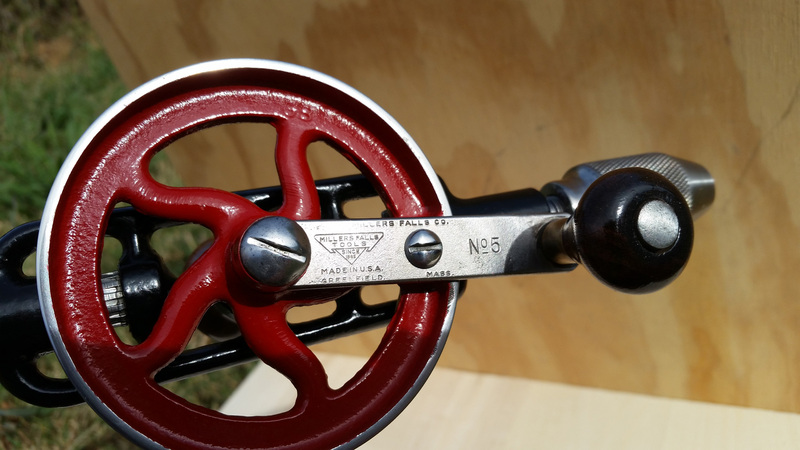 The wheel is a pain to mask off, and I ended up doing it twice – once before blasting, once after, since the grit lifted the tape a little and got up on the adhesive. My favorite trick with small parts masking is to use pieces of expanding foam ear plugs to fill small holes you don’t want to get grit into. Here’s a hazy photo taken through my blast cabinet window. 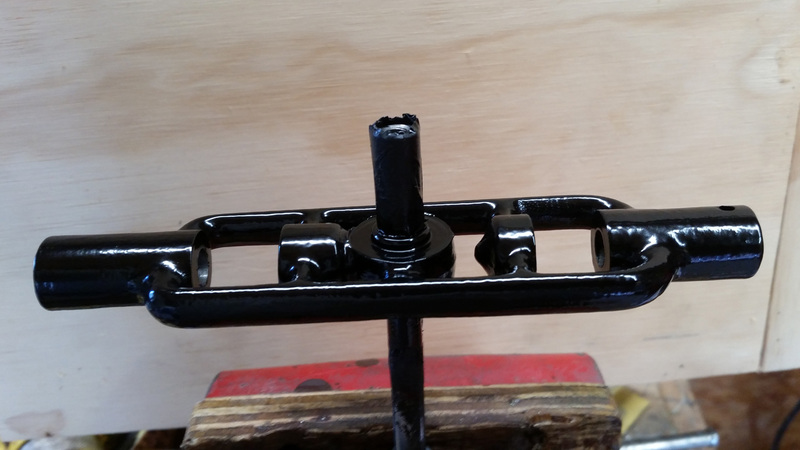 I just got the cabinet, in part because I want to do a lot of these hand drills, and sand blasting really cleans up the nooks and crannies of frames and wheels, much easier than sandpaper and a wire brush. 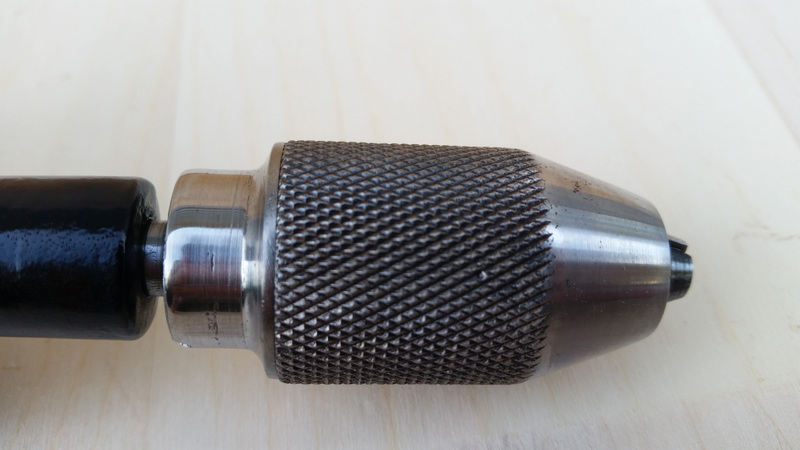 Wire brushes can damage the soft cast metal. Here is the frame after blasting. The little pegs are sections of cotton swab shafts that I use to fill small holes, such as oil ports. They do a good job, but I lost one during blasting. The wheel axle is taped off since it had it’s final surface already. The frame came out and I dusted it, hit it with acetone to remove any fingerprint oil, and dusted again. Then I took the frame straight to paint. I tried something new this time: two thin-to-medium coats of Dupli-color gloss black (DE1613), followed by one medium coat of Dupli-color engine enamel semi-flat black (DE1635). 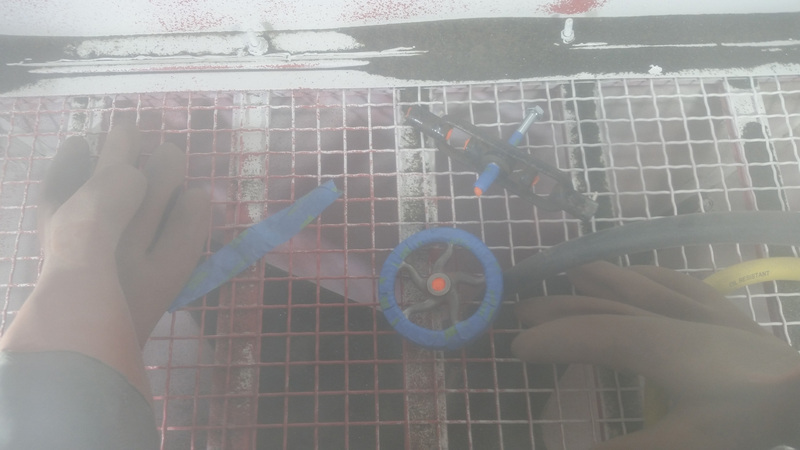 The wheel had to be re-masked after blasting, but it wasn’t a big deal. I painted it with Dupli-color engine enamel in red (DE1653). Exploded parts view. 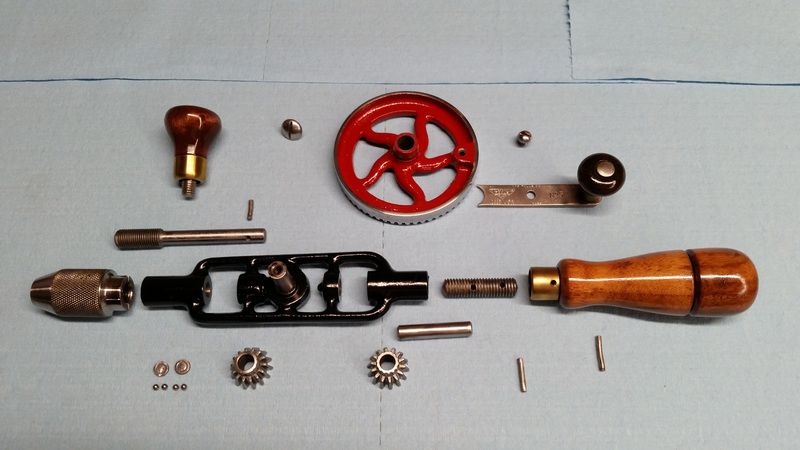 Everything here has been restored except for the bent pins, which I replaced with brass pins as described in part 2. 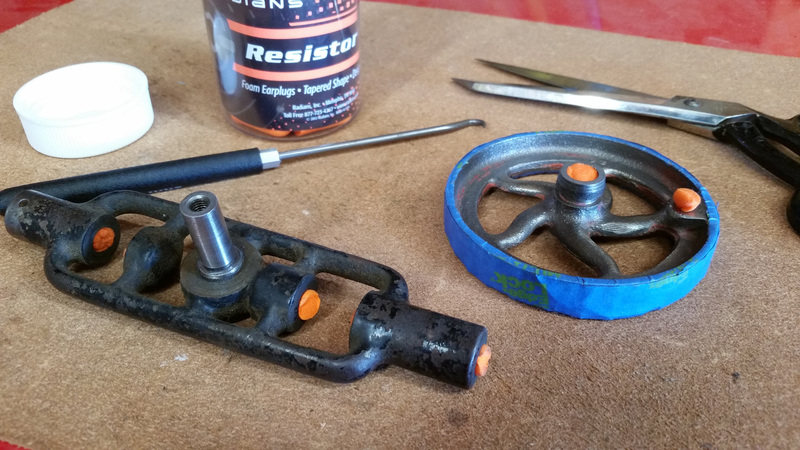 A little SuperLube brand grease helps to keep the ball bearings and races together as they’re being placed back into the frame. 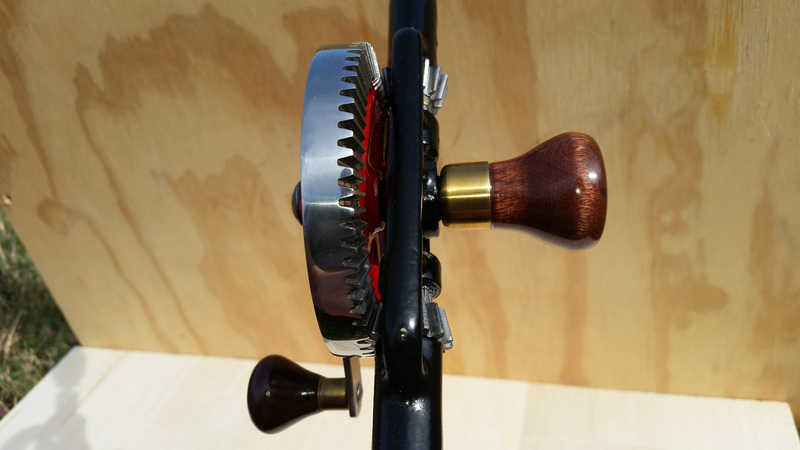 The wooden handle came out beautifully, and the threads are in great shape. The cap fits on snugly. You can see two of the brass pins holding the handle on the frame. 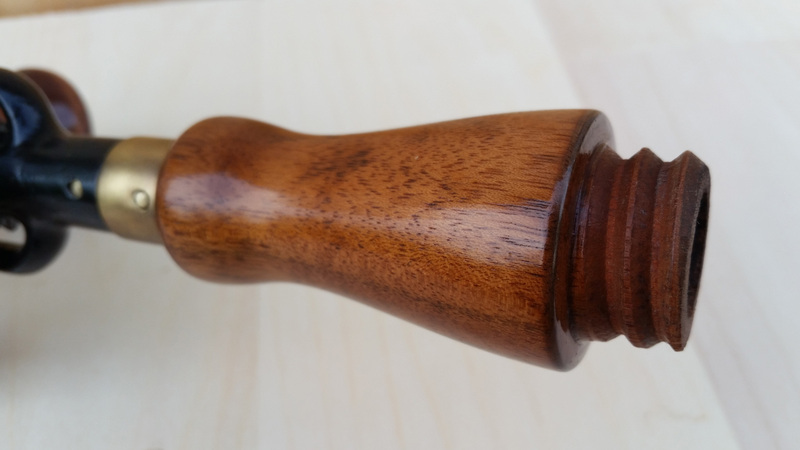 The handle has a slight bit of wiggle to it, which I think is due to the holes in the wood having wallowed out a tad over the years. 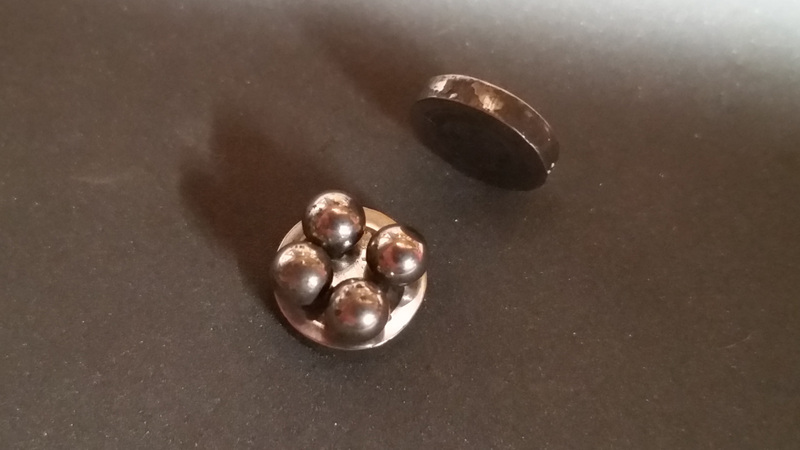 I’m reluctant to drill out everything for a larger pin – it’s not a significant amount of movement. 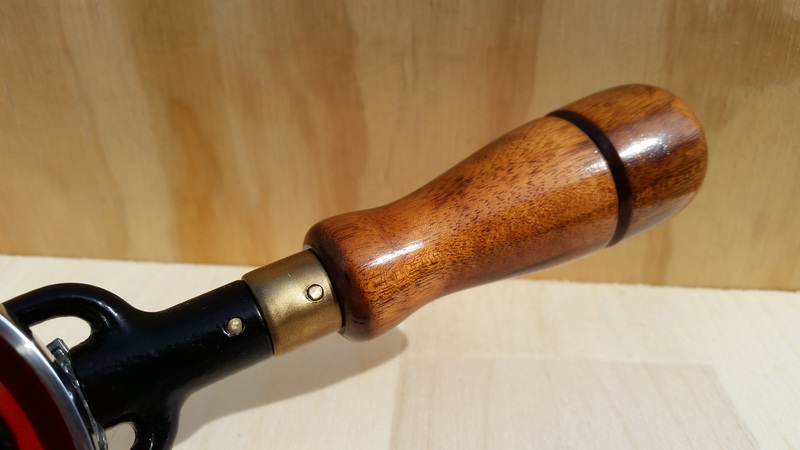 Another shot of the handle. The chuck is polished, lubed, and ready to go. 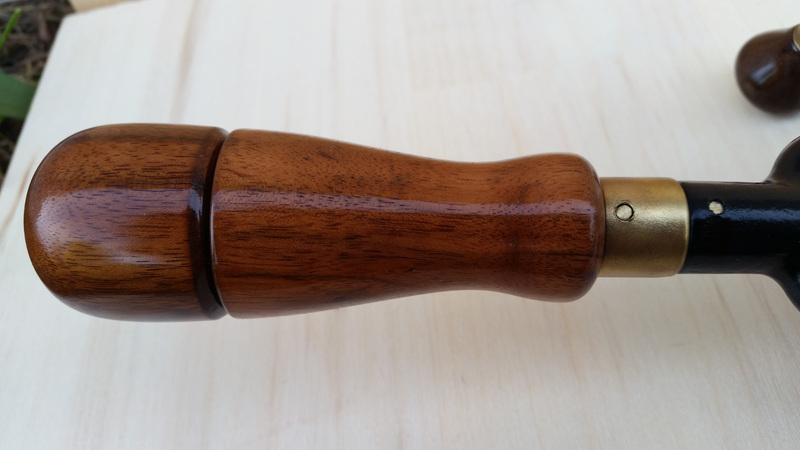 The side knob came out very prettily. Here are some more gratuitous shots. There’s a ’68’ cast into the wheel – founder’s mark. 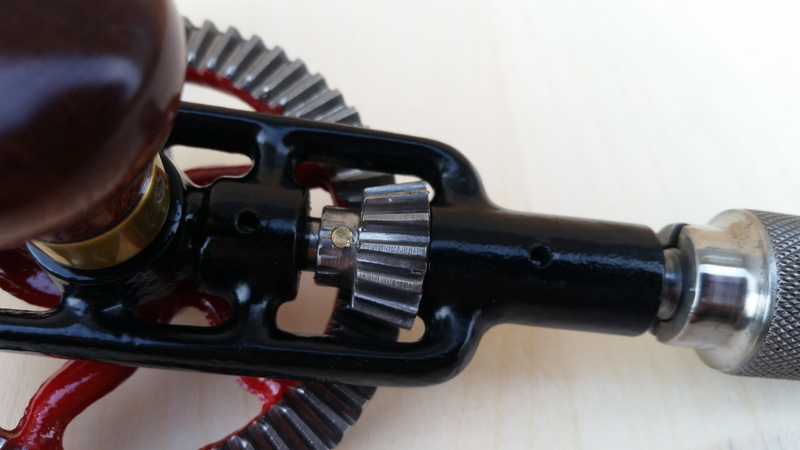 The drill was oiled, but the future user should remember to occasionally lube these ports. It ran a lot smoother once I’d dripped a little mineral oil in there. 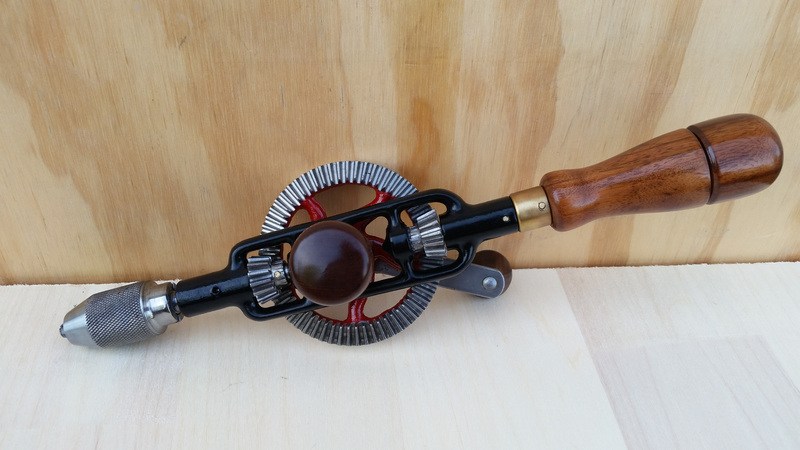 Restored, lubricated, tuned, and ready for another 50 years of service. 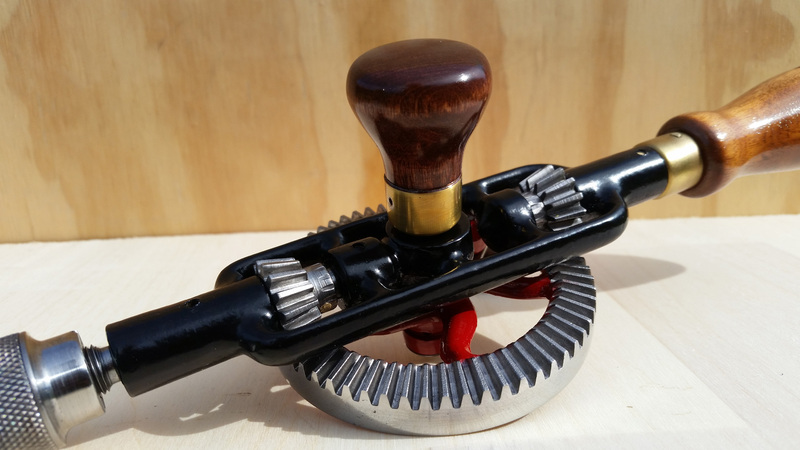 This drill will be a pleasure to hold in the hand while you work. 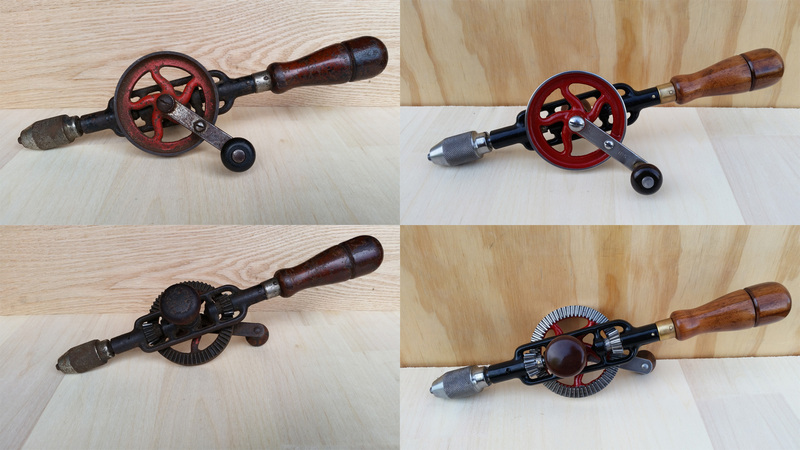 This restoration transformed a rusty old tool that barely worked into a gorgeous hand drill that is a pleasure to hold and is ready for a new lifetime of service. 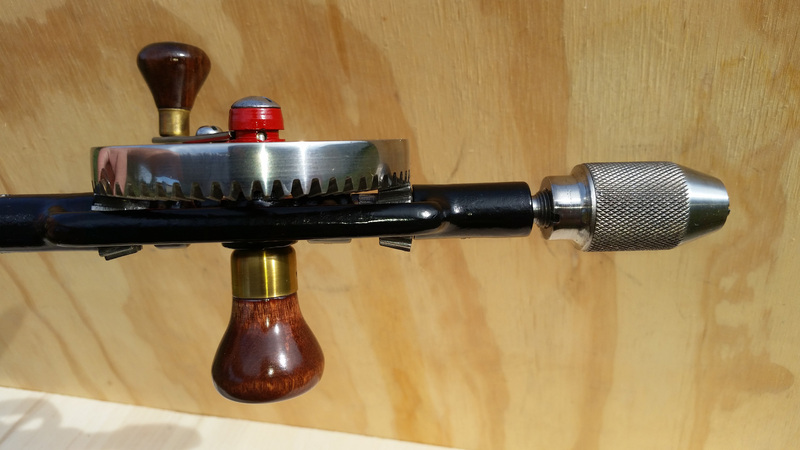 I always intended for this drill to be a user, but in my mind, the enjoyment of holding a beautiful tool that feels great in your hands contributes immensely to the experience of using it. 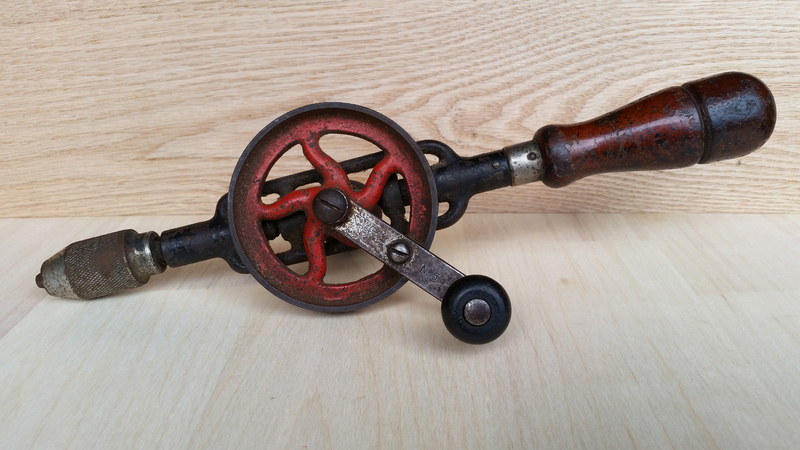 This is a restoration, so if you look closely enough, you’ll find evidence that this drill is 60+ years old, but I suspect it looks even better than it did when the original owner purchased it. 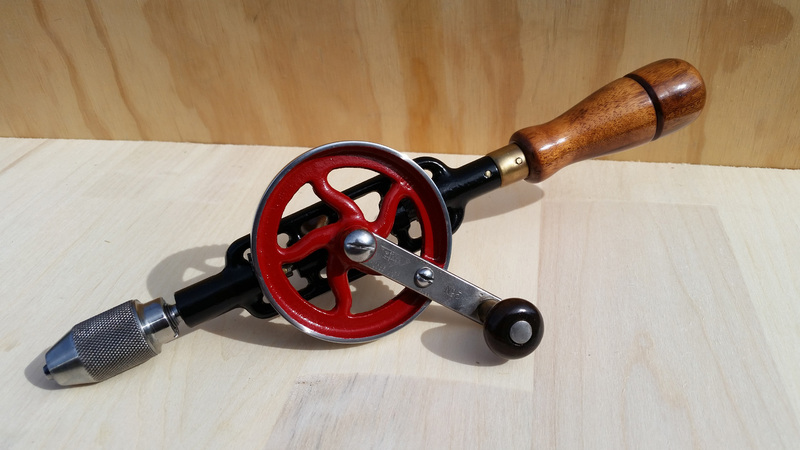 My plan is to sell this beauty, and I’m sure the new owner will enjoy holding and using this drill in their own projects. 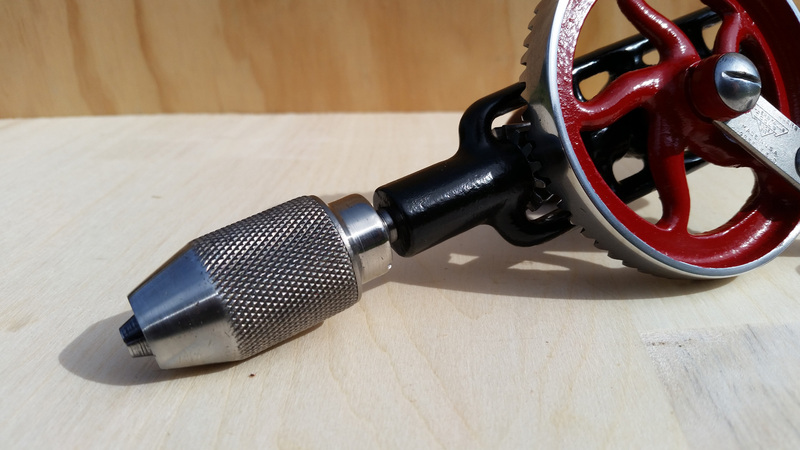 I had a great time working on this drill. Now that I have a blast cabinet, I’m anticipating a quicker turn around on these projects. If you’ve followed this series of posts this far, thank you. Please leave me a comment if you enjoyed this restoration or if you found it helpful (or if you think I should mention something else). Good day Michael, Excellent job and thank you for sharing your work. I’ve learned and will be implementing your restoration techniques. 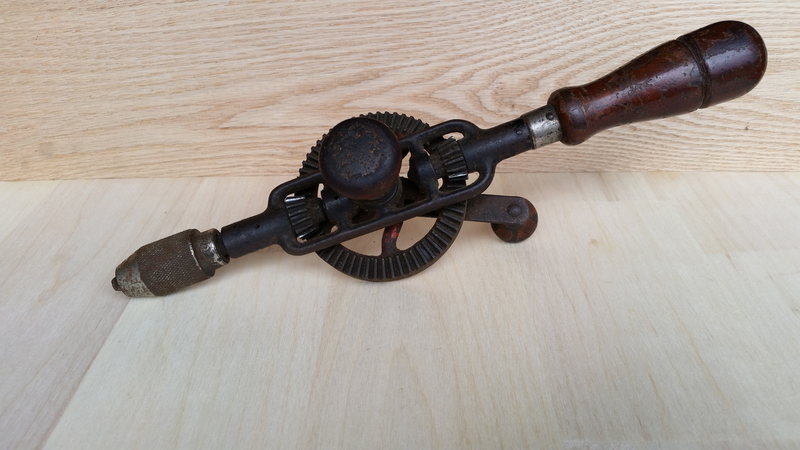 I would really love to do more hand drill restorations, however, very little vintage hand drills available here in South Africa. Thanks, Paul! 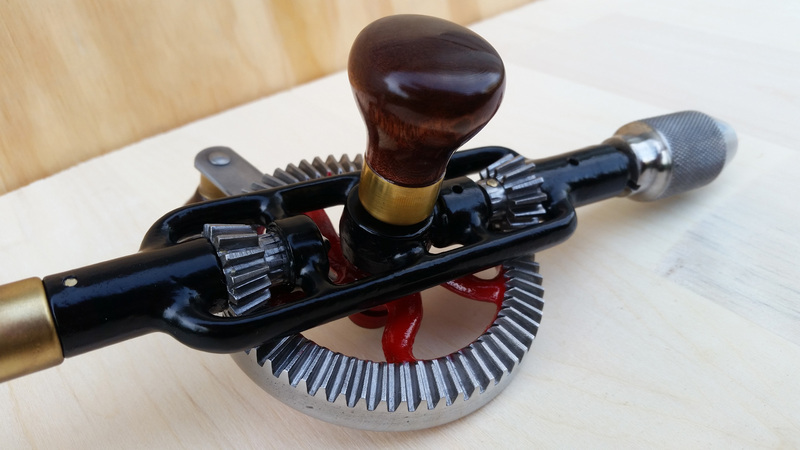 I have run across several wood workers from South Africa on various forums. Y’all get to work with some interesting woods. 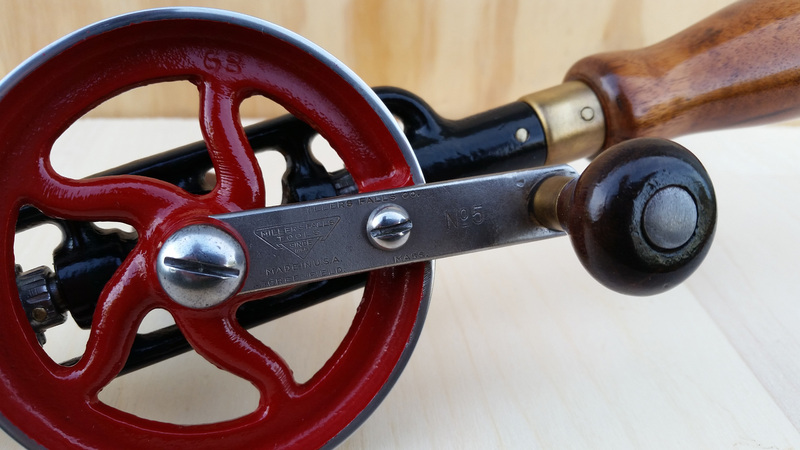 Good luck with finding more antique tools to restore. Fabulous and respectful restoration job.